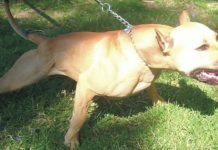 Behavior problems can literally mean life or death for Pit Bulls. Every day people turn over their dogs to a shelter because they exhibit problem behaviors. When people are tired of dealing with a problem behavior they usually take the easy way out and get rid of the dog instead of getting rid of the behavior through work and training. 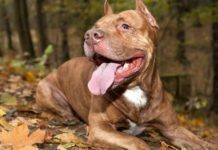 If you are looking for information about how to solve a specific behavior problem then you’ll find more specific solutions in The Pit Bull Training Handbook. This article we will cover the first steps to solving problem behaviors regardless of what they are. When addressing any behavior problem we must first consider what the dog is getting from the behavior. Let’s take jumping for example. Jumping is a classic example of attention seeking behavior. You should remember that jumping is perfectly normal in the canine world. 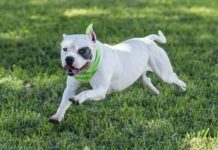 Most problem behaviors like jumping are in fact normal for dogs and dogs do not see them as problems. Sticking with our jumping problem the next thing you need to consider is the level of the problem. Is jumping an aggressive behavior? Like the dog putting their paws on the chest, growling, and staring into the person’s eyes? This happens most with dominant breeds who have been allowed too much freedom and consider themselves the leader. Or is the jumping friendly in nature? Most of the problem jumping is friendly jumping. When dealing with any behavior problem we want to use four components. Positive reinforcement of acceptable behavior. Management and setting the dog up to succeed. When you address any behavior problem you should keep these four components in mind. I’ll use jumping again as an example. Following is an example of a dog that jumps when guests come over. Jumping is an attention-getting behavior and dogs love to get attention. Any attention, even if it is negative attention is better than no attention at all to a dog. In this scenario, the sit-stay would be acceptable behavior. Another possible behavior would be the down-stay. You will want to start doing sit-stays by the door when no guests are present. Repeat these training sessions by the door as often as you can. The more the better. Also, if you get guests coming through the back door or garage etc… repeat the sit-stay in these locations as well. You want to reinforce this behavior with treats, praise or toys and you want to do it often. You want to have your dog on the leash when guests come over. For guests that just show up, have the leash hanging by the door. You never want to let your dog succeed in jumping on guests at this point. If you can not control the dog, take the leash and lead them into another room out of the way. Management is important because if you allow your dog to continue jumping he will be rewarded for the wrong behavior. Setting the dog up to succeed can be accomplished by having a mock guest help you train your dog in the beginning stages. I do not advocate physically correcting a dog for a behavior problem. Unless that problem endangers the dog or the training program the dog is involved. With that said, in this case, we want to ignore the dog and remove the reward (attention) for his behavior. 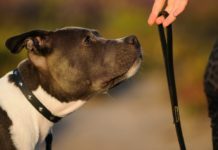 With your dog on the leash, ask them to sit-stay. Then let the guest in. If they break the sit-stay you should immediately say, “eh eh!” or “no!” and the guest should turn around and remove all attention from the dog until your dog is sitting calmly again. You will have control of your dog because they are on the leash. The “correction” here is the removal of the reward (attention) by the guest. Once your dog understands he or she is only rewarded for sitting calmly and not for jumping you will start to see less jumping and more sitting. I get a lot of questions about behavior problems and I’m amazed at how many people email me after a week or two and tell me that their dog is not listening or the technique isn’t working. The speed at which any technique works is based on the dog and how consistently the person is with using the four key components. One dog may stop jumping after two weeks while another dog may take three months to stop. Consistency is critical to successfully eliminate a behavior problem. Everyone in the home should be involved and everyone should train the dog exactly the same using the same techniques. If one person trains the dog to down and the other trains them to sit, your dog will become confused and their success will be limited. Using the four key components will help you get a handle on any behavior problem. 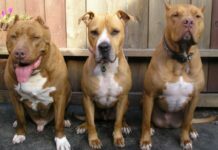 Dogs are creatures of habit and Pit Bulls are no exception to this rule. Remember to be consistent and only reward acceptable behavior. Also, remember that you can not allow a dog to do something when you think it’s okay and then punish them when you think it’s not. You will only confuse the dog if you take this route to behaviors. Take your time, learn as much as you can about the problem itself and if needed hire a professional to help you stop the undesired behavior. 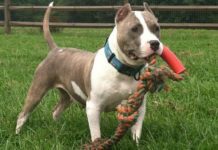 As I mentioned at the beginning of this article, The Pit Bull Training Handbook covers more specific behavior problems and how to solve them. If you have any questions about this article please feel free to email me.